You may have never heard of the Sports Lounge on Pratamnak, but after reading this review I am sure you will want to find it. Taking “find it” first, it is just a little tricky, but take into account that Miss Terry Diner has been known to get lost crossing the street. Sports Lounge (Bar and Eatery) is on Soi 1 Pratamnak, which is off Pratamnak Road, going up the hill towards the Fitness Park. Go up under the over-pass and on the left is the new Uniix building. Immediately after that is another soi on your left which splits in two. This is Soi 1 and was the old entry to a place called the Stork Club. However, instead of following that narrow road up, you turn immediately left into a wide soi and the Pattaya Heights Condo is on your left and the Sports Lounge is clearly marked on the ground floor of the building. We went at lunchtime and were immediately impressed by the cleanliness, and by the welcoming smile of the owner K. Aor and her service staff. The seating is either in alcoves, each with its own private television screen, or in a more open section with high bar stools, some set around circular tables. You can entertain yourself or a number of friends quite easily. 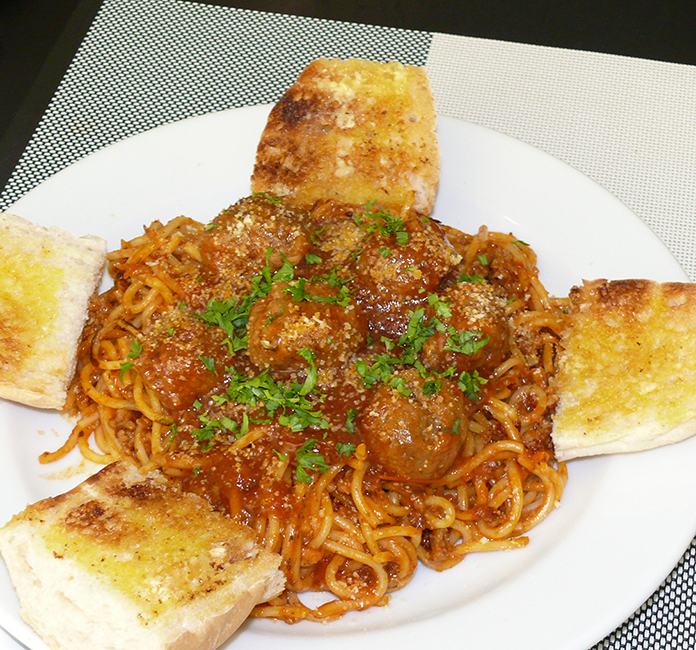 A huge plate of spaghetti and meatballs. The menu is partly photographic, but describes each dish in detail. The hungry sportsman can have no complaints there! It begins with ‘Build your own’ breakfasts with items generally around B. 25 and if your breakfast has five items, they will throw in a Hoagie roll for free! Soups are next up at B. 80 for a small serve, then starters and snacks with the jalapeno poppers with cheddar and cream cheeses (B. 160) looking very inviting. Some salads (B. 130-180) and Mexi chicken spring rolls (see later)! With the cuisine concentrating on US, Mex, UK there is one complete section devoted to American sandwiches with most around B. 160-195, including BLT’s and meatball subs and a pulled pork burger. 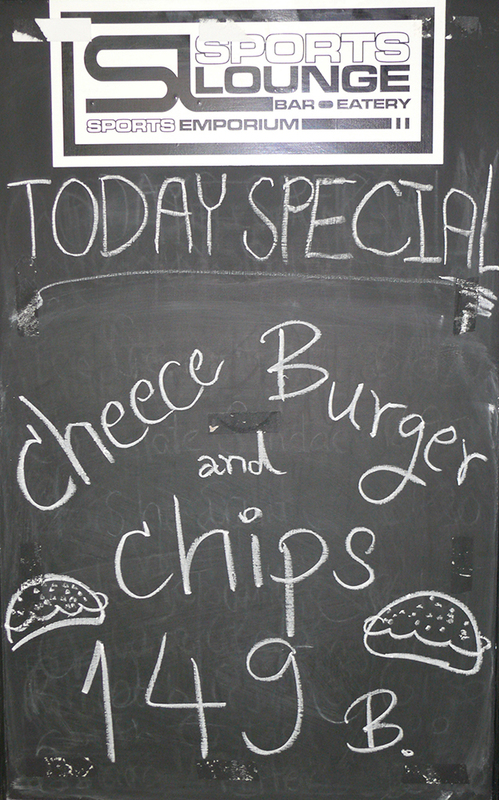 A range of burgers follows with a plain burger at B. 145 all the way through to a Mexican burger with the lot (B. 215)! Main courses are very varied, with meatballs and mash (B. 175), through to fish and chips (B. 225), bangers and mash (how English is that?) and up to a premium imported 12 oz Aussie rib-eye steak. Then there are desserts, if you have an insatiable hunger. Yes, there is a range of 20 Thai food items available, generally around B. 140. Local beers are around B. 60-70. We began with a very cold refreshing ale and then shared a plate of Mexi-chicken spring rolls (B. 160). These deep-fried starters have chicken and salsa combined with mozzarella and cheddar cheeses, wrapped and then fried and served with a creamy dill dipping sauce. These were fabulous. A trace of spiciness and definitely ‘more-ish’. The spaghetti dish was very large, with garlic bread as well as the bolognaise sauce. It was very filling and actually too large for Madame to finish! In retrospect, we should have taken in back to the office as SL does do takeaways. Oh yes, there is a pool table. My burger was also a very filling item, and the toasted bread roll deserves a mention. Crusty and held the 1/3 pound patty without going soggy. Chips had been deep-fried in fresh oil, and I was very satisfied with both the burger and the chips. Sports Lounge Bar and Eatery, Pattaya Heights Condo, Soi 1 Pratamnak, telephone 038 250 762, on-street parking, open six days (closed Mondays) 9 a.m. until late.